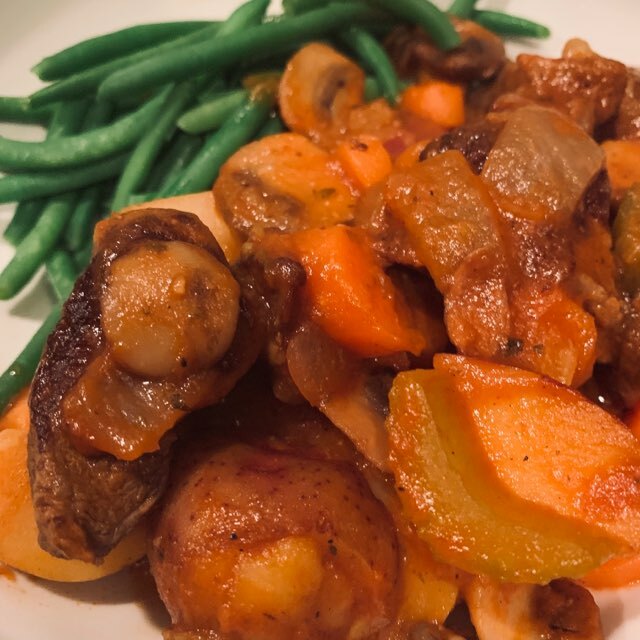 Growing up, beef stew was a staple in our home. My mom made it often. She also made a killer pot roast. I always looked forward to those meals. This recipe is a perfect combination of both those dishes! To successfully make this dish, make sure you take the extra step of browning the beef. It adds so much extra flavor that will make your stew just that more delicious. 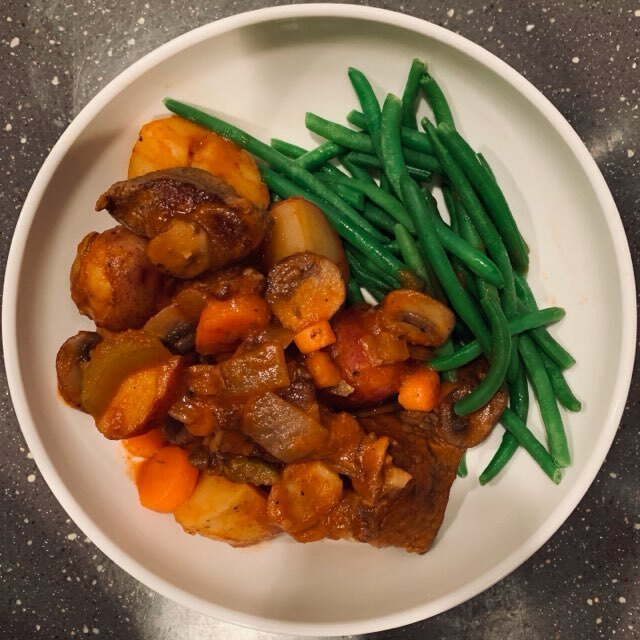 Because stew cooks for quite some time, make sure you don’t cut your veggies too thin, that way they won’t get mushy and breakdown during the cooking process. You can use and type of potato you would like, but I think the colored potatoes are best and make the dish look delicious. 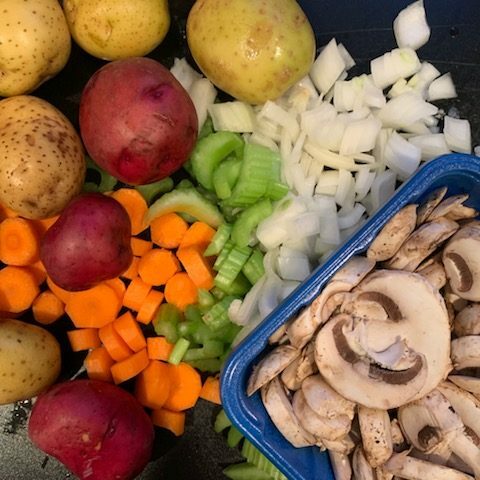 If you are using mini potatoes you can leave them whole, but small potatoes should be cut in half and medium potatoes should be quartered. 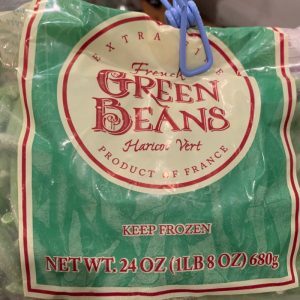 I typically serve my stew with a side of green beans or peas to balance out the potatoes in the stew, but it could be served by itself, or on top of egg noodles or mashed cauliflower. Mom used serve pickled red cabbage on the side. Yum. 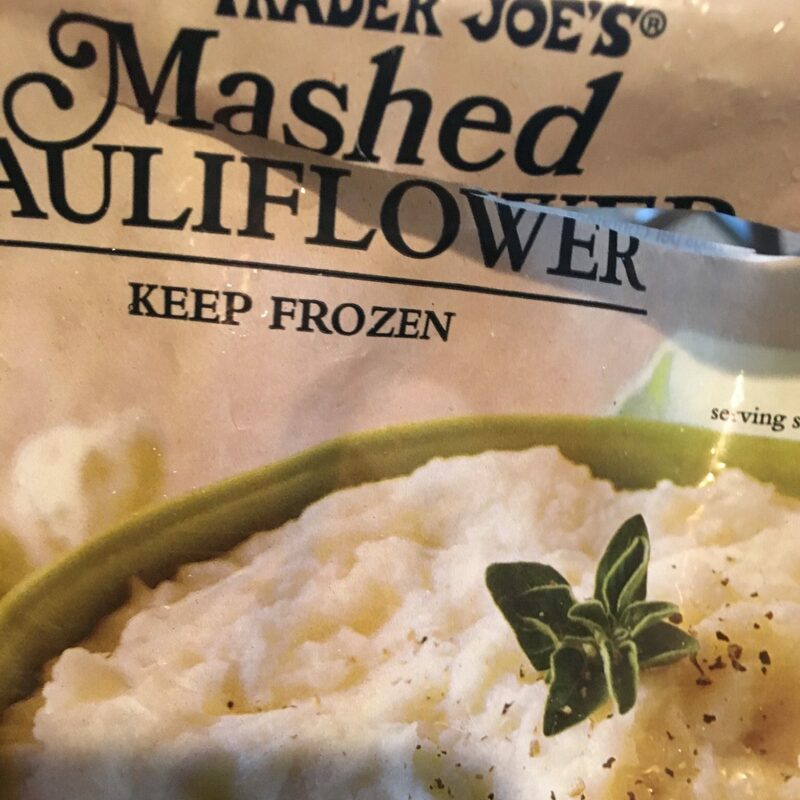 I love Trader Joe’s Frozen Haricot Vert (French Green Beans) and Trader Joe’s Frozen Mashed Cauliflower. Your whole family will love this dinner, and you’ll love how easy it is to make! 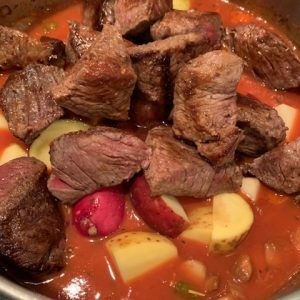 It will take some time to bake, but on a cold day when you are cozy inside in your favorite sweat pants and fuzzy socks, you’ll be able to savor all the delicious aroma that comes from this amazing stew. 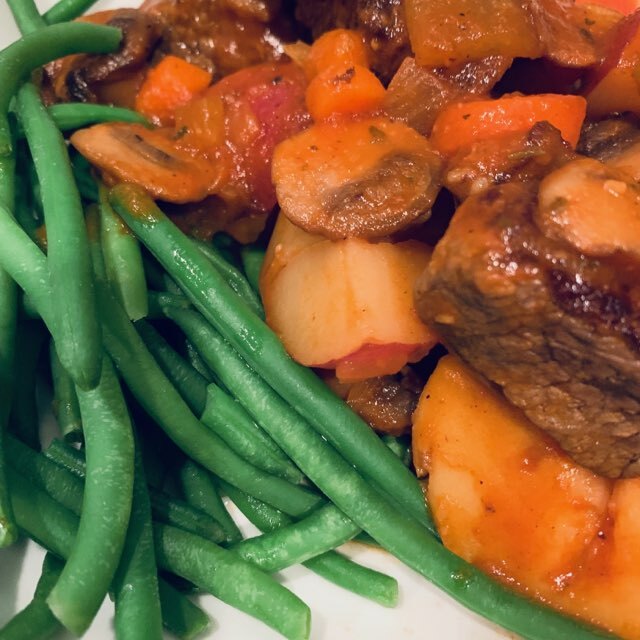 Now go forth me Lords and Ladies and make this knock-out stew that’s sure to please a hungry mob from peasants to royalty. *Images are copyright of TheFrayedKnot.com and can only be used with permission. No need to worry about being beaten and robbed by The Hound after serving this delicious stew. This recipe is sure to make your guests stick around and help you with the farm. Fair wages for fair work. Place beef in a large bowl and heavily season with salt & pepper. You may think it's too much seasoning, but it's not. The salt & pepper will help to make a nice sear on the meat. Add 1 tbsp of olive oil to large oven proof pot and heat on high. Once pot is thoroughly heated carefully add meat making sure that all the meat is in a single layer on bottom of pot. Sear in 2 batches if needed. 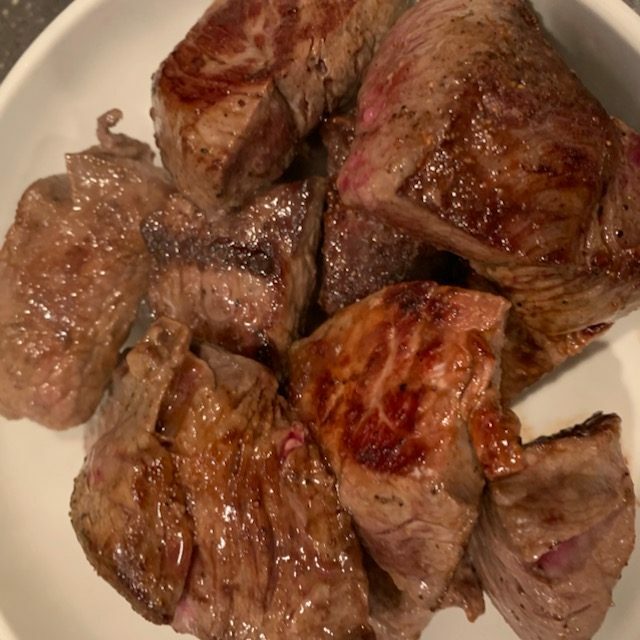 Cook until beef is nicely browned, about 3 minutes on each side. Transfer browned beef to a bowl and set aside. Reduce heat to medium and add 1 tbsp olive oil. Add the onions, carrots, celery and garlic and 1/4 tsp of salt and 2 grinds of pepper. Stir frequently and cook until onions are translucent and mushrooms start to shrink. Add tomato paste and stir to combine. Add and herbs de Provence and sugar and stir to combine. Reduce heat to low and carefully add marsala wine to deglaze the pot while scraping up all the tasty bits stuck to the bottom of the pot. Add the beef stock and tomato sauce. Stir to combine and simmer for 2 minutes. Add cut potatoes to pot and make sure they are fully submerge in the soup. Add more beef stock sparingly if necessary. Return browned beef and meat juices to the pot and push down into soup. Bake in covered pot for 1 hour and 30 minutes or until potatoes can be easily pierced with a fork. Remove from oven, stir in parsley and let rest for 10 minutes. Salt & Pepper to taste. Serve with vegetable or on top of mashed cauliflower or gluten-free egg noodles. Order Your TFK Market Tote Today! A portion of the proceeds from this tote will be donated to the care and welfare of animals.